“I only hope that we don’t lose sight of one thing – that it was all started by a Mouse” – Walt Disney. My favorite Disney quote and a true reminder of what’s possible with your imagination and determination! Welcome to Mickey’s Travel! I first visited Walt Disney World at the age of 27 and was immediately awestruck and completely immersed in this magical place! I just had to go back! And that I have…12 more times since! I’ve experienced all resort accommodation levels, visited at all different times of the year, have experienced many of the “behind-the-scenes” tours (with Animal Kingdom’s “Ultimate Nights of Adventure” and “Wild Africa Trek” being the most recent), and strive to be a part of as many special events as possible! Did someone say “Mickey’s Not So Scary Halloween Party”?? So, what can top a vacation to the Walt Disney World Resort? Adding on a Disney Cruise, of course! 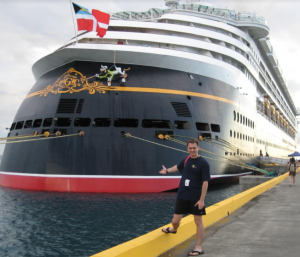 Next to the history and hidden treasures all throughout the World, my greatest vacation passion is Disney Cruise Line! I have sailed with DCL 19 times within the past 10 years. Destinations include the Panama Canal, Alaska, Hawaii, the Bahamas, the Southern Caribbean, Eastern Caribbean, and Western Caribbean…all with Steamboat Willie himself! Aruba, Bermuda, and Europe are next on the list! I was very fortunate to be on the Maiden Voyage of the Fantasy, was on the second sailing of the Dream, and was on the first sailing of the original re-imagined Magic! Why do I love Disney so much you might ask? The answer is simple…the “Disney Difference”. Attention to detail, exceeding expectations, courtesy, and respect…all attributes I live and work by. What’s your Disney passion? Share with me what it is about Disney that you love the most and we’ll plan your vacation centered around that. Are you new to all-things Mickey Mouse? Let’s discover your passion together! You imagine and I’ll create! Looking forward to working with you!